Calendar Kitten Christy looks great on 2, 3 or 4 wheels.In this case its a wild 3-wheel Trike built by George Tchor of Creator Customs in Ontario, Canada. 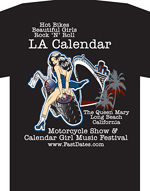 FastDates.com Calendars are highest quality full color 15 x 15" wire spiral bound printed on heavy art stock revealing 16 months beginning with September. new 2015 SBK World Superbike Champion Jopnthan Rea and the full Kawasi Raceing Tea. 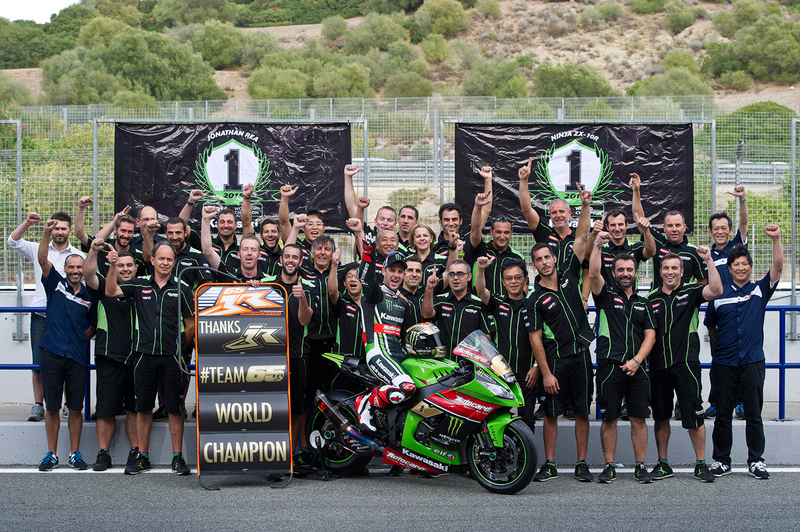 Oddly, Tom Sykes is not inthis team picture but his crew is. Click to go BIGGER. 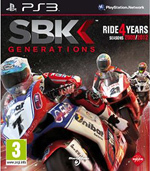 Jerez, Spain, Sunday, Sept 20th 2015 -Jonathan Rea (KRT) scored two fourth place finishes at Jerez today to take the FIM Superbike World Championship crown. After the second 20-lap race of the day Kawasaki was confirmed as Manufacturers’ Champion. Tom Sykes (KRT) won the first race of the day and finished fifth in race two. 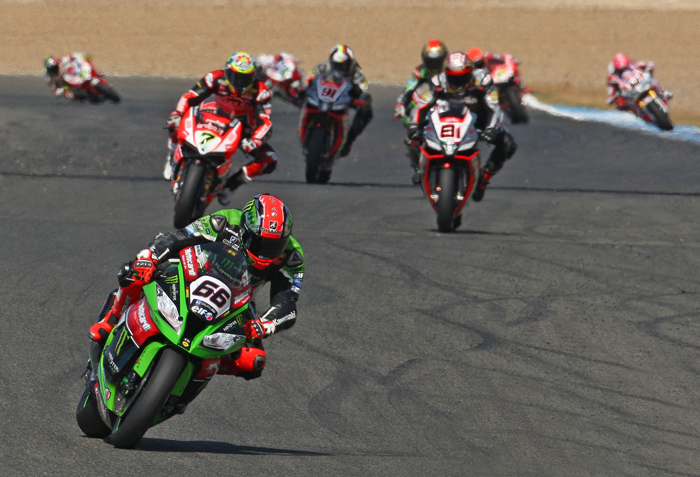 Jonathan Rea realised he only needed six points from the Jerez weekend to make sure he won the title but in finishing fourth in race one he took more than he needed and win his first World SBK championship, with five individual races to spare. These two races were the first times in 2015 that Rea had finished off the podium in what has been a remarkable season so far. 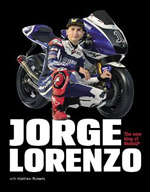 His 12 races wins, 20 podiums and ability to score big points every time out gave him the edge that he and his official Kawasaki team used to such effect - from the first race win in Australia in February to his championship win in Spain in mid September. 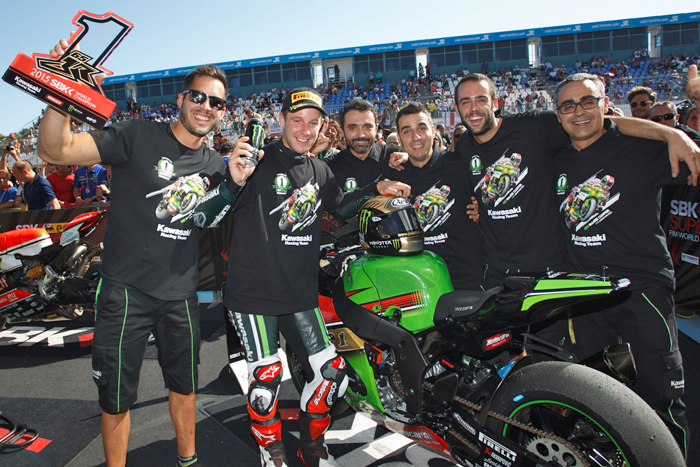 Tom Sykes has now scored four race wins in the season so far, playing his full part in helping Kawasaki secure the Manufacturers’ Championship after the second race at Jerez. Tom had a typical front running success in the first race today, leading every lap and enjoying an impressive margin of victory of almost three seconds. Choosing a less than ideal tyre option for race two meant he led for ten of the 20 laps, but dropped back to fifth place. Rea has grown his points total to 478 after Jerez. Race two winner Chaz Davies is second overall on 353 and Sykes has 331 points, in third. The next round will be held in Europe again, at the Magny-Cours circuit in France, on October 4th. 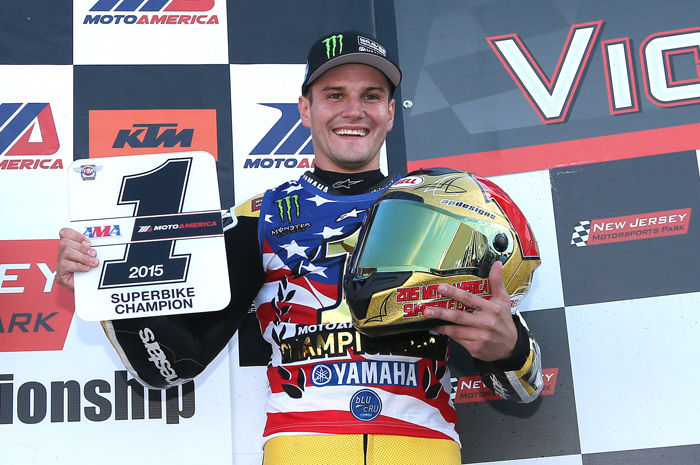 Davies and van der Mark complete the podium ahead of the new Champion. The opening race of the Pirelli Spanish round of this year’s eni FIM Superbike World Championship has been won by Tom Sykes (Kawasaki Racing Team), the former champion notching up his 60th WorldSBK career podium finish as team mate Jonathan Rea sealed his first World Title by finishing fourth after an early race fight with rival Chaz Davies (Aruba.it Racing – Ducati SBK Team) who eventually finished 2nd. Sykes dominated after leading from the start easing away to take his 26th race win. Not wanting to risk a mistake, Rea was overhauled by Michael van der Mark who showed some real speed on his Pata Honda, the Dutchman claiming his 3rd podium of the year ahead of the new World Champion and Leon Haslam (Aprilia Racing Team – Red Devils) who was in contention despite a lowly 11th position grid slot. Michele Pirro (Aruba.it Racing – Ducati SBK Team) finished a credible 6th ahead of Voltcom Crescent Suzuki’s Alex Lowes, Matteo Baiocco (Althea Racing), Leon Camier (MV Agusta Reparto Corse) and the outgoing champ Sylvain Guintoli (Pata Honda World Superbike Team) who completed the top ten. Jordi Torres made life difficult for himself, the Aprilia Racing Team – Red Devils rider running off track at the start. Rejoining he ended the opening lap in 18th before eventually finishing 12th 4 seconds adrift of compatriot David Salom (Team Pedercini) who had the accolade of being the best placed Spanish rider. The final points finishers were Roman Ramos (Team Go Eleven), Leandro Mercado (Barni Racing) and Ayrton Badovini (BMW Motorrad Italia). Niccolò Canepa (Althea Racing Ducati) was running a strong fourth in the early stages before losing the front of his Ducati Panigale at Turn 6. The Italian, fresh from his first front row start was able to rejoin proceedings – he eventually finished 17th. Chaz Davies stalked early race leader Tom Stkes agian in Race Two before passing, with Sykes' race tires soon loosing traction due to the increased afternoon temperatures which visibly hampered the factory Kawasaki bikes more than any other team. 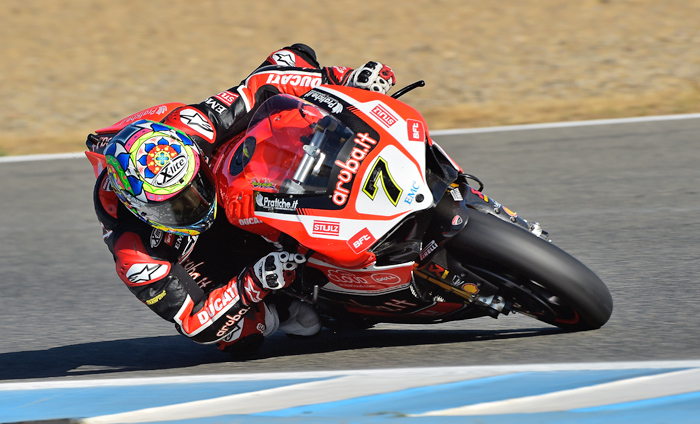 Chaz Davies (Aruba.it Racing – Ducati SBK Team) went one better than in race 1 to win the second race of the day at a very hot and sunny Jerez Circuit in Spain. Unlike the opening encounter, Tom Sykes (Kawasaki Racing Team) was unable to break away after taking the holeshot for the second time. Despite stretching his advantage in the early stages, the Race 1 winner was passed with ten laps to go as his tires overheated and lost traction, allowing Davies to catch and pass him with Chaz grabing his ninth win of his career, the fifth of 2015 and the fourth in the last six races. Jordi Tores (81) leads the battle for 2nd position in Race 2 ahead of team mate Leon Haslam and newly crowned champ Jonthan Rea. The race pace was slower this afternoon, as expected because of the increase in track temperature, with Davies pulling away in the second half of the race to win by 1.840s from Jordi Torres, who made amends for his race 1 and edged his Aprilia Racing Team – Red Devils team mate Leon Haslam at the line. 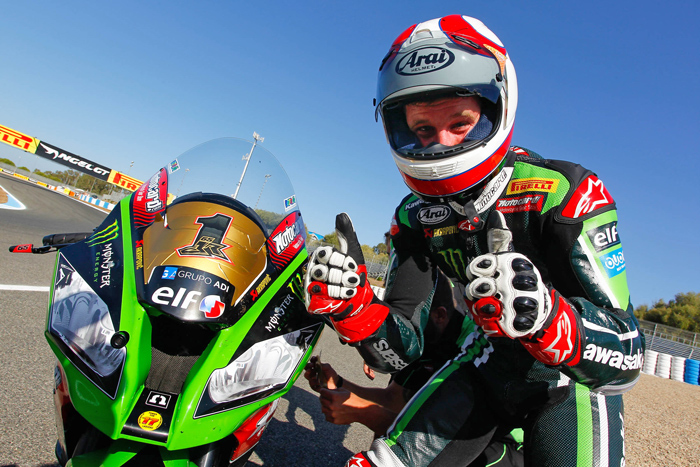 Fresh from winning the 2015 Superbike World Championship title in race 1, Jonathan Rea took another fourth position aboard his Kawasaki ahead of Sykes, who seemed rider one who suffered the most in the hotter conditions.The top 6 was completed by Matteo Baiocco (Althea Racing Ducati) ahead of Michele Pirro (Aruba.it Racing – Ducati SBK Team), who had another solid race to finish seventh. 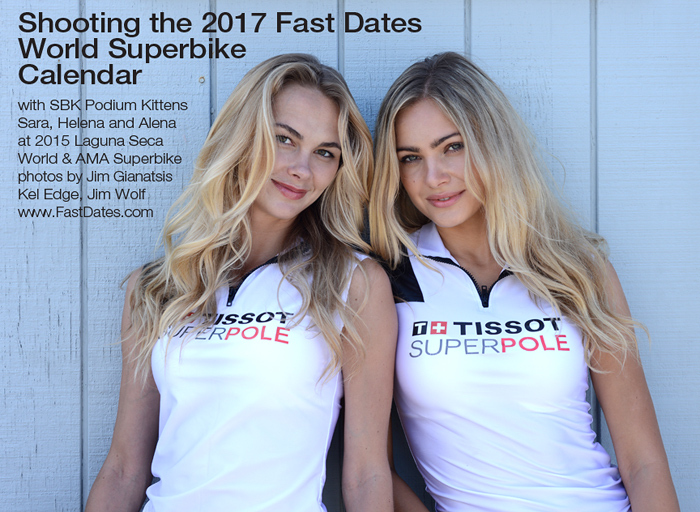 8th to 10th positions were taken by Leon Camier (MV Agusta Reparto Corse), Sylvain Guintoli (Pata Honda World SBK Team), who had his 150th WorldSBK race start, and Leandro Mercado (Barni Racing). Niccolò Canepa finished eleventh after starting on the front row aboard his Althea Racing Ducati with David Salom (Team Pedercini) in twelth place. Michael van der Mark crashed his Pata Honda out of the podium fight with five laps to go. The Dutchman was however once again in contention until he lost the front at Turn 9. He rejoined to salvage three points with 13th at the flag. 14th was Ayrton Badovini (BMW Motorrad Italia), with the final point taken by the youngest competitor Christophe Ponsson (Team Pedercini Kawasaki). Alex Lowes (Voltcom Crescent Suzuki) was given a ride through penalty after pulling into the pit lane after a lap, a disappointing end to his weekend after a strong showing in Race 1. By finishing 4th and 5th in Race 2, Rea and Sykes give Kawasaki its first Manufacturer Title. The WorldSBK riders will return to the track tomorrow for a one-day official test at Jerez, which can be followed via Live Timing and through regular updates on WorldSBK.com. 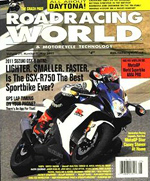 Rea first mounted the all-conquering Kawasaki Ninja ZX-10R at MotorLand Aragon on 17 November 2014, supported all the way by Team Manager and former rider Guim Roda. The Northern Irishman arrived in Malaysia at the start of August already with a mathematic chance of claiming the title, despite three rounds still remaining of the 13. 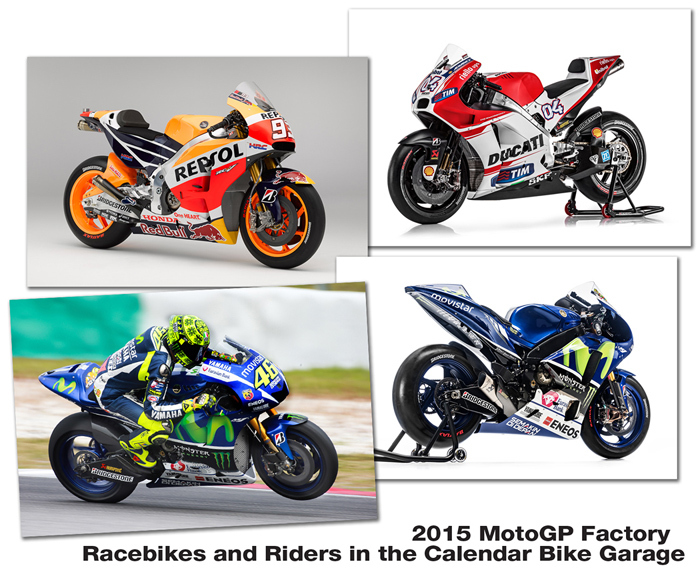 After Race 1 at Jerez, he has now won 12 races this year and picked up 20 podium finishes from the first 21 races. 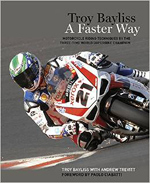 He is chasing Doug Polen’s 1991 record of 17 race victories in one season, which can now only be equalled. ince the inauguration of WorldSBK in 1988, Rea is the third rider to win the crown on a Kawasaki motorcycle. 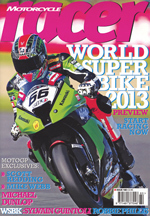 The first was American Scott Russell in 1993, while the next was Rea’s current team-mate Tom Sykes two decades later. 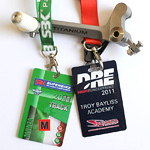 Rea has also become the first different World Champion in as many years (with the last five titles having been sealed by Carlos Checa, Max Biaggi, Tom Sykes and Sylvain Guintoli) and the fifth British World Champion after Carl Fogarty, Neil Hodgson, James Toseland and the aforementioned Tom Sykes. Although Rea’s raw talent has never been questioned over the past six seasons, it wasn’t until the 28-year-old from Ballymena rode the green bike that his maximum potential could be extracted. All the while off the track, the humble Briton has remained a professional, unassuming human being, rider, husband and father. He currently resides on the Isle of Man. The coveted crown in his hands, the new number one faces the rest of the season with copious amount of convince, fully aware of the many goals he can still achieve and the fact that Jonathan Rea is the 2015 eni FIM Superbike World Champion. Date of birth 2 February 1987, Place of birth Ballymena, Northern Ireland. Married with 1 child. Davies and the Aruba.it Racing - Ducati Superbike Team score their fifth SBK win of the season! Jerez de la Frontera (Spain), Sunday 20 September 2015 – fantastic results for Chaz Davies and the Aruba.it Racing - Ducati Superbike Team in the Jerez World Superbike races; having reached the podium in race 1, in second position, the Welshman put together a faultless race 2 to achieve his fifth win of the season! Michele Pirro completed two good races, crossing the line in sixth and seventh place. Race 1 – from sixth on the grid, Davies got away very well, moving straight into third place. Chasing down the Kawasakis ahead of him, the Welshman reached and passed Rea on lap seven to take second position. In the second half of the race Chaz was able to increase his pace but unfortunately it was not enough to reach race leader Sykes, meaning that the Aruba Ducati man crossed the line in second position. Pirro, seventh on the grid, held that position throughout the opening laps. In the first half of the race, the Italian struggled to close in on his rivals on the new tyre but, thanks to a significantly quicker pace in the second phase, he caught up to Haslam and Rea, immediately ahead of him, to cross the line in sixth position. 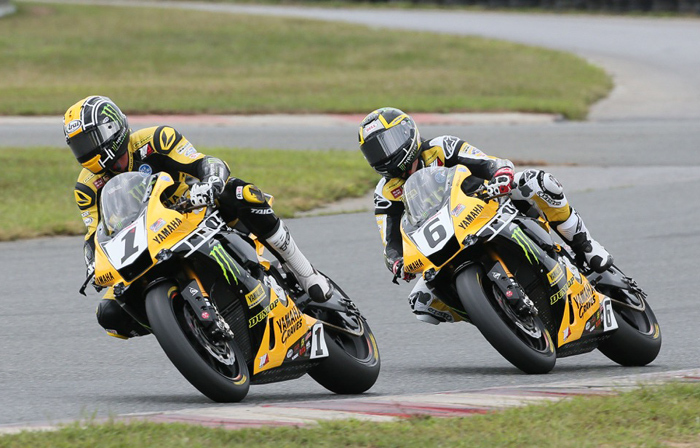 Race 2 – once again Chaz quickly got into a good rhythm and was lying second through the opening stages. He did well to fight off the advances of the chasing pack and, thanks to his extremely strong pace, was able to pass Sykes to move into the lead on lap eleven. Gradually increasing his lead while effectively managing the final phase of the race, the Aruba Ducati man crossed the line in first place, with an advantage of almost two seconds. This marks his fifth win of the 2015 season, thanks to which he consolidates second position in the overall standings. 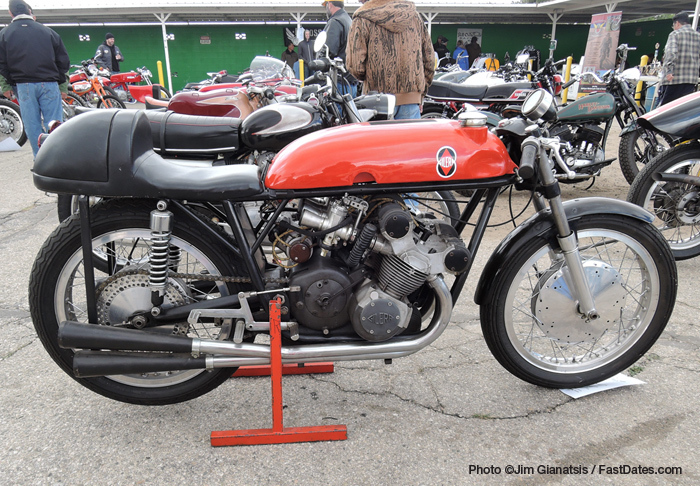 For Pirro, the second race was more difficult. In order to prevent the front of the bike from moving around so much, a harder front tyre was selected for this second race but unfortunately this resulted in a more dramatic loss of grip in the afternoon’s higher temperatures. Michele nevertheless maintained a constant pace which allowed him to conclude in seventh position. With only two rounds left to run, Chaz Davies continues to hold second position in the overall standings, with 353 points, while Michele Pirro has earned points enough (35) to place twentieth. Ducati maintains second position in the manufacturer’s standings with 408 points. 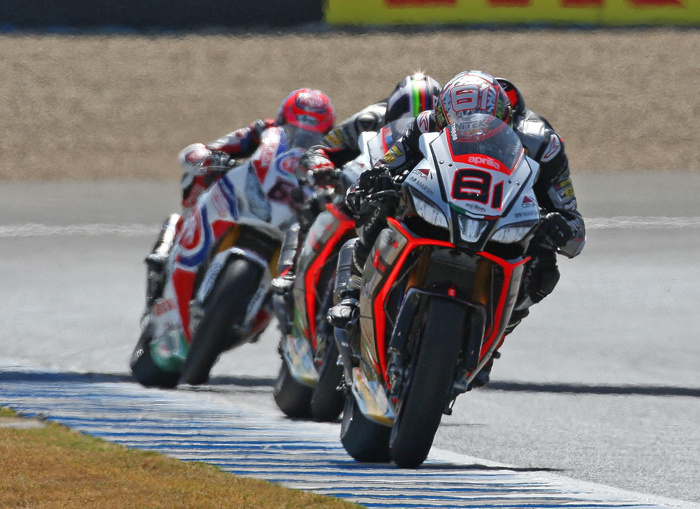 Jerez, 20 Sept 2015 – The Superbike weekend at Jerez de la Frontera ended with to Aprilia RSV4 machines on the podium. Van der Mark was able to right his lightly-damaged CBR and re-join the race, matching the lap times of eventual winner, Chaz Davies. The Dutch rider finished in 13th place to consolidate seventh place in the overall championship standings.